”From being in overall charge of the series and running the events, my role is going to change in 2007,” explains the EERC’s James Tucker. The other significant change regarding EERC events is that “the Dunlop / Britcar events will become official championships in the eyes of the RAC MSA. “These will be for the existing Britcar, ProductionS1 and Britsports races, and an application is being made for the V8 Championship,” continues James Tucker. At least two British GT Cup teams have suggested that they will race in Britcar events next year, if British GT becomes a GT3 only class. James Tucker is already planning next year’s calendar, which will begin in April, and include six events before the Britcar 24 Hours, on circuits that will include Brands Hatch GP, Silverstone International, Donington Park and Spa. 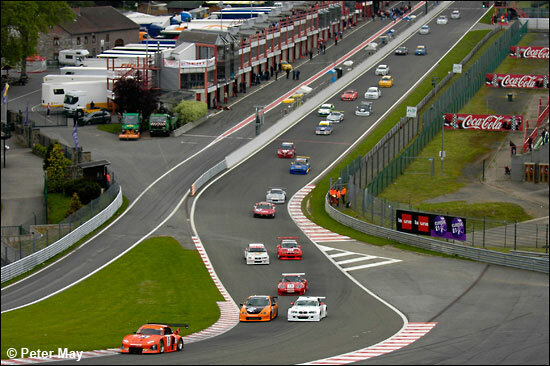 This is the combined Britcar / ProductionS1 field at Spa last Saturday evening, at the start of the four hour race.